Ninety-five years ago today, August 26, 1920, women were granted the right to vote. 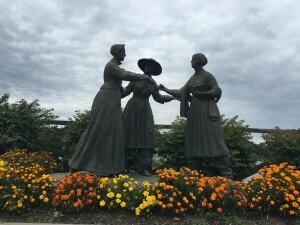 By chance, we happened upon a statue of three women in Seneca Falls, NY. It represented Susan B. Anthony, Amelia Bloomer (dress reformer), and Elizabeth Cady Stanton meeting – shaking hands. Anthony and Stanton played leading roles in the cause of woman suffrage. If not for this meeting, the Nineteenth Amendment giving women the vote might not have passed. Anthony and Stanton were very instrumental in the women’s suffrage movement. I thought it so coincidental that we saw it on the exact anniversary. Along with Susan B. Anthony and Elizabeth Cady Stanton, I have one to two line clips from the lives of six other rural women I visited with today. They were all at wineries around the Finger Lakes in NY. I called them all Inez. “I am in my second year of vet school at Cornell University and I work here only part time – I have a lot of studying. Rural women are diverse, innovative, and do what they can to contribute. It has been so rewarding to consciously get brief stories each day of our long bike trip.